Hey, loves! I had to be gone to take care of emergent matters. However, now everything is good, so let's make up for that sucky-ness with an awesome book review, shall we? 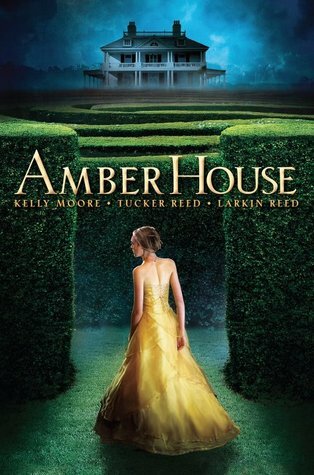 Okay, so this next book is Amber House by Kelly Moore, Tucker Reed, and Larkin Reed. (A lot of authors, ay?) Look at this absolutely gorgeous cover!!! Sarah Parsons has never seen Amber House, the grand Maryland estate that's been in her family for three centuries. She's never walked its hedge maze nor found its secret chambers; she's never glimpsed the shades that haunt it, nor hunted for lost diamonds in its walls.But all of that is about to change. After her grandmother passes away, Sarah and her friend Jackson decide to search for the diamonds--and the house comes alive. She discovers that she can see visions of the house's past, like the eighteenth-century sea captain who hid the jewels, or the glamorous great-grandmother driven mad by grief. She grows closer to both Jackson and a young man named Richard Hathaway, whose family histories are each deeply entwined with her own. But when the visions start to threaten the person she holds most dear, Sarah must do everything she can to get to the bottom of the house's secrets, and stop the course of history before it is cemented forever." Maybe it's the three-author thing, or maybe it's my love of books that can take me to another time and place. Maybe it's because I'm close to my little brother and can still decode what he's saying (he speaks Lexi, lol). I dunno. But the book is amazing. The historical parts of this novel are quite wonderful. Maybe one author created just the house itself. Maybe another took on the characters. Maybe that's why everything is so beautifully and wonderfully detailed and developed. You'll get caught up in this great story plot, the beautiful house that serves as amazing scenery, and the characters that make this tale shine. This is a fun story. It even has a ball! This reminds me of a beautiful mansion in the South, you know? And I love the love and drama that the South always evokes. (I'm not talking about any kind of hatred towards anybody, cuz that just breaks my heart.) There's this romanticism that makes me think of a Willow tree in front of a sprawling house, tons of history, and then ghosts from the past. Might just be me, lol. But this story evokes the same kind of feeling with all of the history and everything. Even if you're not into things like that, you should read this novel. It has so many twists and turns in it! And then you get blown away by the entire book, especially the ending! In Conclusion: READ. THIS. BOOK.